Since the launch of Rise earlier this year, we have built an impressive pipeline and have achieved some great wins. We want to thank you, our teammates and partners, for your support and collaboration. And in case you didn’t yet hear, Rise was recently honored with a Best of the Best Red Dot award. For those not familiar, Red Dot recognizes leaders across industries that excel at business and design. We join an elite group of high-profile past recipients including Apple, Nike and Coca-Cola. As you can imagine we were all very proud. Today marks yet another milestone in the history of Rise. When we announced the launch of our Rise Global Incentive Program, we wanted to introduce a fresh new way to reward and celebrate the hard work of our partners. Not only did we want to measure impact, have a bit of fun, and build stronger relationships, we also wanted to recognize some of the great people on our team, and in the process, help a lucky winner score a brand new Tesla. 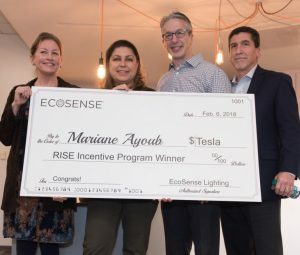 The recipient of the Rise Global Incentive Program prize embodies our values through and through. We are thrilled to announce Mariane Ayoub as our winner. As a Specifications Sales Manager at sixteen5hundred in San Francisco, Mariane’s collaborative spirit and winning mindset stand out. “Mariane has proven herself as a leader and partner. She’s trusted, supportive, and always willing to go the extra mile to get things done,” says Rob McCulley, Vice President of Global Sales, Ecosense. Mariane’s firm, sixteen5hundred is a valued partner and bonafide powerhouse. Since the late ’90’s, they’ve only represented the best lighting companies and have garnered a reputation for consistent innovation and service. We are thrilled to be in their company. Location is key, and there’s a reason why sixteen5hundred picked San Francisco as their headquarters – the Bay Area has become an innovative and sophisticated lighting hub where technology intersects with design. “There are very creative lighting designers here,” Mariane adds. “The West Coast, in general, has always had a reputation for pioneering in the lighting space. We’re early adopters of innovative solutions are always pushing the bar through design.” These values couldn’t be more closely aligned with Ecosense. And we’re excited about the continued partnership with Mariane and sixteen5hundred. In upcoming updates, you will learn more about what’s in store for 2018. Until then, thank you for your tremendous support.